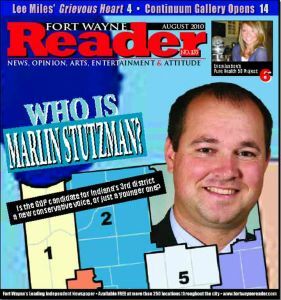 Home > Features > Who is Marlin Stutzman? Is the GOP candidate for Indiana’s 3rd district a new conservative voice, or just a younger one? Congressman Mark Souder’s sudden resignation on May 18, just weeks after he had won the Republican primary, roused over a dozen conservative contenders from their post-primary slump, all eager to nab the GOP’s nomination as the candidate for Indiana’s 3rd district in the US House of Representatives. The list of names was a long one. Back for a second shot at the seat were Phil Troyer (at least initially; he dropped out later); car dealership-owner Bob Thomas, hoping to capitalize on his own fairly strong showing in the primary; and Greg Dickman. Rachel Grubb from Auburn returned (and this time, she meant it!). Also on the roster were Liz Brown from Fort Wayne’s City Council; Ryan Elijah from Indiana’s News Center; local business owner Bob Morris; and State Representative Randy Borror. We could go on, but suffice it to say the hundreds of Republican precinct committee people who caucused on June 12 did not lack for choices. Yet despite the sizeable roster of candidates, the caucus was over in just three rounds, with State Senator Marlin Stutzman (District 13) from Howe emerging as the clear winner. Stutzman’s victory was a surprise to… well, almost no one who had followed the build-up to the caucus. Despite the narrative we’ve all heard this year — that the 2010 mid-term elections will be driven by populist anger (especially on the conservative side) and fuelled by the perception that the government is more beholden to special interests and cronyism than its constituents — the reality in Indiana, and our corner of it, doesn’t really jibe with all that anti-establishment rhetoric. The Republican nominee for Senator is Dan Coats, a guy who was already Senator and returned to run again after a stint in Washington as a lobbyist. And as we all know, Stutzman is replacing Mark Souder; in all the turmoil surrounding Souder’s sudden resignation and the caucus to choose a candidate, it’s easy to forget that the Congressman from Grabill won the primary in early May. In other words, if he hadn’t resigned, Representative Souder would be gearing up for a campaign that could have made him Indiana’s 3rd district US representative for a 9th term. Stutzman has spent a significant amount of time in the Indiana legislature. First elected in 2002 to the Indiana House of Representatives for District 52 (at the ripe old age of 26), Stutzman went on to become the State Senator for District 13 in 2009, winning the Republican caucus on that occasion after incumbent Bob Meeks resigned due to health concerns. Last summer, Stutzman announced his intention to run for Democrat Evan Bayh’s senate seat. “We thought we saw a vulnerability there, and we thought we could take advantage of that,” he says. But if Stutzman’s time in the state legislature and his association with Congressman Souder (he was an assistant to Souder from 2005-2008) might have raised a few eyebrows among the more grassroots members of the GOP, he seems to have plenty of other conservative credentials to make up for it. On social issues, Stutzman’s campaign touts his involvement in pro-life and Second Amendment legislation — with the latter, he helped author and pass the “Lifetime Handgun Permit” law, which grants a lifetime permit to carry a handgun to any gun owner who passes the exam. “I’m a big fan of what Governor Daniels has done here in the state in limiting the size and scope of our state government,” he adds. 86 people	reviwed this story with an average rating of 2.3.